Warning: this statistic is alarming. According to the American Association of Oral and Maxillofacial Surgeons (AAOMS), cancer of the mouth and upper throat is the cause of death for someone nearly every hour of every day. That translates to 9,750 lives annually. Getting an oral cancer screening to identify changes in oral health or abnormalities in tissue is key to early detection. 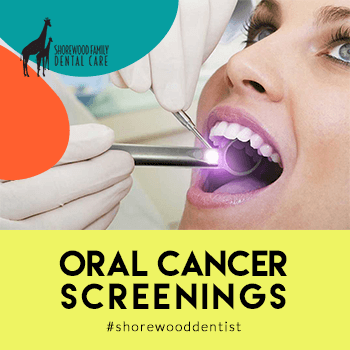 Because April is Oral Cancer Awareness Month, we want to make sure you are aware of our special service at Shorewood Dental where we offer to detect early signs of oral cancer. During your regular bi-annual dental checkups, Shorewood hygienists and dentists are on the lookout for changes in your oral health. Now, they also have access to a tool called the OralID to aid in the detection of cancerous and pre-cancerous lesions that may not be visible to the naked eye. OralID is small oral exam light that looks like a medium-size flashlight. The Shorewood clinicians don special eyewear then shine a special blue light into your mouth. The blue light is a product of fluorescence technology. The combination of the light and the special glasses let the dentists and hygienists see the tissue in your mouth in a different way. When the special blue light shines on healthy tissue, it fluoresces green. When the light shines on abnormal tissue, it appears dark. OralID is cleared by the FDA, and the manufacturer provides training to dental professionals so they can feel confident interpreting what they see when using the device. There are a number of factors that contribute to the development of oral cancers. Chemical: Smoking, vaping and smokeless tobacco is the number one risk factor in individuals over 50 years of ages. According to the Oral Cancer Foundation, at 75 percent of people diagnosed with oral cancer at age 50 or older are or were tobacco users. Alcohol consumption can also play a role, especially when used with tobacco. The Oral Cancer Foundation points out that because alcohol has a dehydrating effect on cell walls, it is easier for tobacco carcinogens to enter mouth tissue. Physical: Excessive exposure to the sun is a well-known cause of skin cancer, including the lips. Radiation exposure over a lifetime can contribute as well. Behavioral: Poor oral hygiene can be a contributing factor over time. In some studies, poor nutrition with a diet that is low in vegetables and fruits has proved to be one of the risks factors for oral cancer. Biological: Some forms of the human papillomavirus (HPV) have been found to contribute to oral cancer. Look and feel inside the lips and the front of gums. Tilt head back to inspect and feel the roof of your mouth. Pull the cheek out to see its inside surface as well as the back of the gums. Pull out your tongue and look at all of its surfaces. Red and white patches, called erythroleukoplakia. Sore(s) that fails to heal and bleeds easily. Abnormal lumps or thickening of the tissues. Difficulty in chewing or swallowing a mass or lump in the neck. Questions Regarding Oral Cancer Screening? You want to stay healthy, and so does every member of our team at Shorewood Family Dental Care. If you have any questions about oral cancer or to get an oral cancer screening, please call 815-725-5991 or contact us to request an appointment with us.